Scratchers are such an important thing to have in your home when you live with cats. 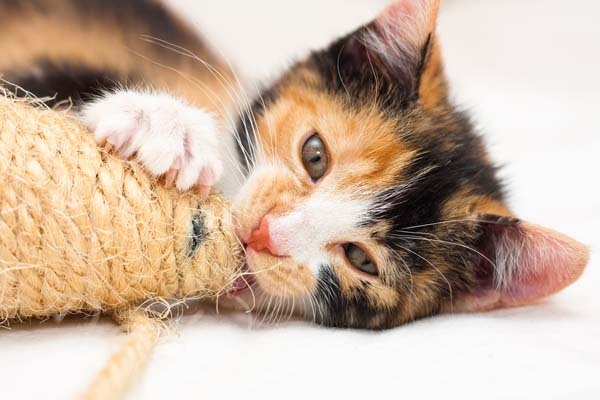 Scratchers allow cats to condition their claws, removing the old outer layer; plus, scratching gives kitty a chance to work out her back and shoulder muscles, and it lets her leave her visual and scent mark so she feels ownership of her territory. Having multiple scratchers is a good idea, especially if you have more than one cat, but I hate tripping over too many things when I walk through my living room. I am always looking for ways to declutter the floor, so one of my favorite things is the wall-mounted scratcher. 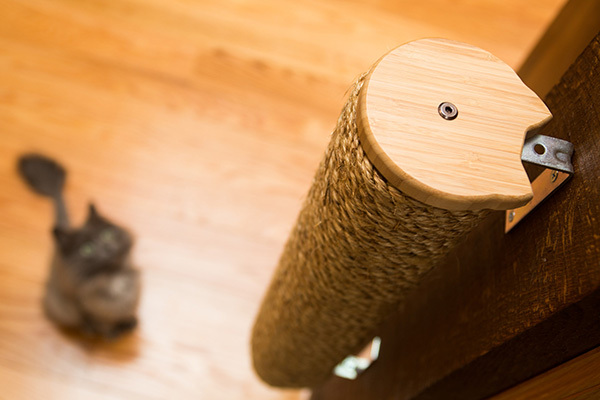 Scratchers that attach to the wall not only free up floor space, they allow you to position the scratcher at any height so you can accommodate cats who like to scratch down low or up high. Also, wall-mounted scratchers attach securely to the wall, so there’s no chance of them toppling over like with floor-standing scratchers. So, if you’re going to go through the hassle of punching holes in your wall, you might as well choose a scratcher that’s not an eyesore! Here are several of my favorites, including some made with different materials, so you can choose one that your cat prefers. For cats who prefer sisal, check out Bootsie’s Combination Scratcher. This scratcher can be used horizontally on the floor or it can be mounted to the wall. 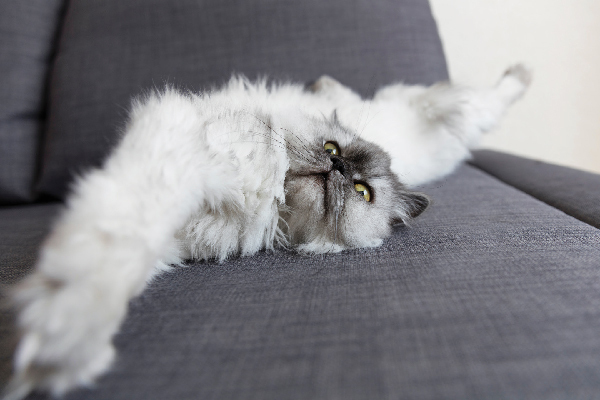 The sisal carpet is the perfect surface for cats to scratch, and it looks great. $17. Next we have one I designed for Hauspanther, a modern wall-hanging cardboard cat scratcher. We use a very high-grade cardboard that doesn’t shed as much as most cardboard scratchers, so you won’t be constantly vacuuming under the scratcher. These have brushed steel endplates that attach to the wall, allowing you to easily flip the cardboard when it becomes worn. $50. Mountain Cat Trees makes this sleek 22-inch wall-mounted vertical scratching posts with an adorable cat head shape for the top piece. 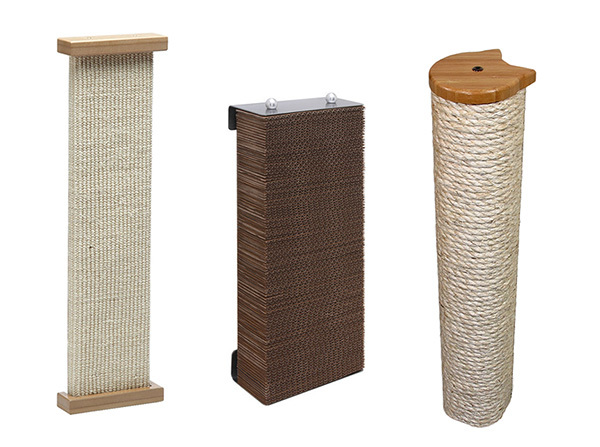 Choose from sisal or manila rope for the wrapping, both great choices for scratching. $56. 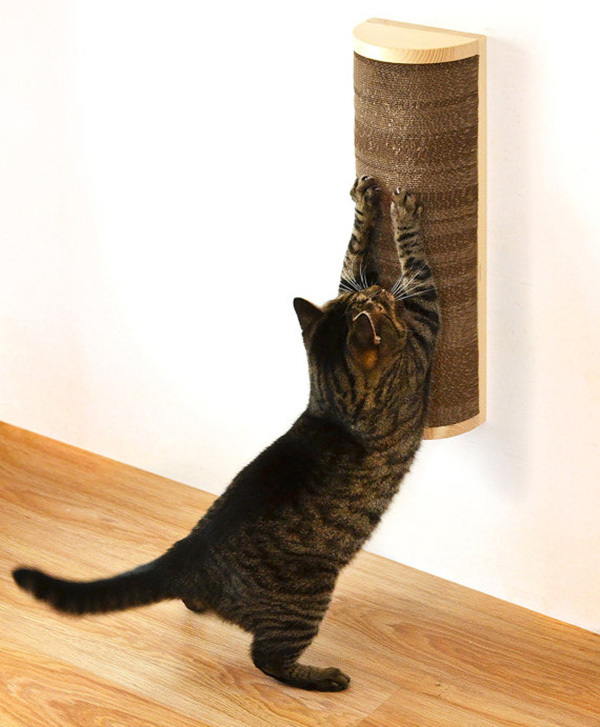 Some cats love to scratch carpet, so instead of letting them go to town on your floor, give them the Itch wall-mounted scratcher from Square Cat Habitat. This beautiful modern scratcher attaches flush to the wall and you can easily remove and replace the carpet when it becomes worn. Choose from black or white laminate or upgrade to sustainable bamboo in amber or natural finish. They offer a rainbow of carpet colors, so I’m sure you can find one to match your decor. Try making a little art installation on your wall with two or three of these. Both you and kitty will love it! $20 to $50 depending on material choices. I love this off-the-floor scratching solution from CatastrophiCreations! It’s a giant sisal-wrapped scratching and climbing pole with a perch on top. Why not take advantage of the space on top to add a hangout spot? It’s a brilliant idea! 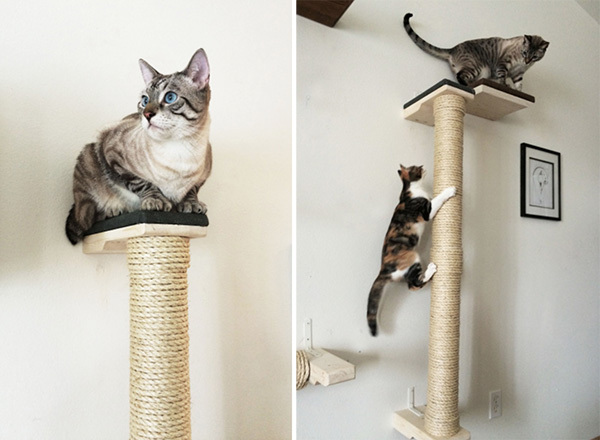 These pieces would make an excellent addition to any cat climbing wall, or you can use it by itself. $120. Another beautiful cardboard scratcher from the folks at Catissa Cat Trees also looks like a piece of modern sculpture. 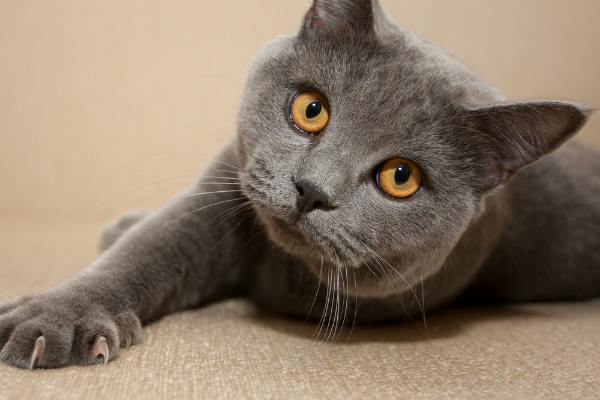 The rounded surface is very attractive to cats, who can really dig in on all sides. The pine frame holds the cardboard pieces and can be refilled as needed. $53. For those do-it-yourselfers out there, we have two easy projects you might want to tackle. 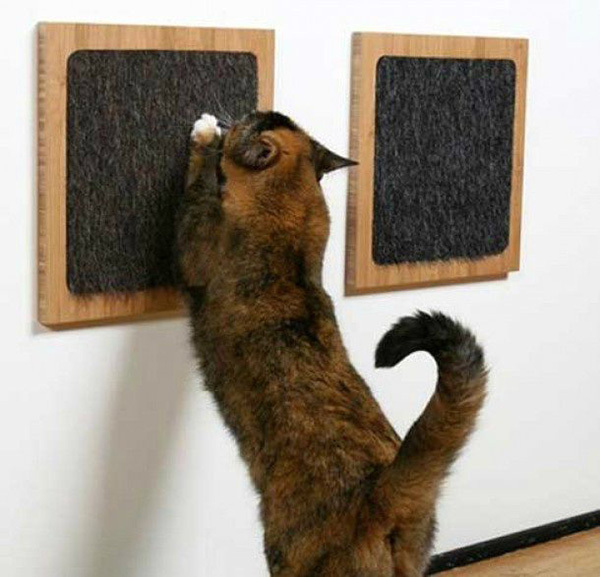 First, check out Eva’s easy wall-mounted scratching board. 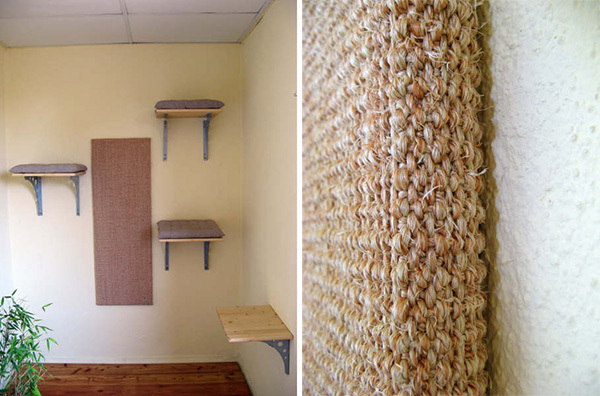 She simply wrapped a wooden board with sisal carpet and attached it to the wall. You can customize it to just the right size for your space. I buy sisal rug remnants online, which would be perfect for this project. Read more about Eva’s DIY project here. 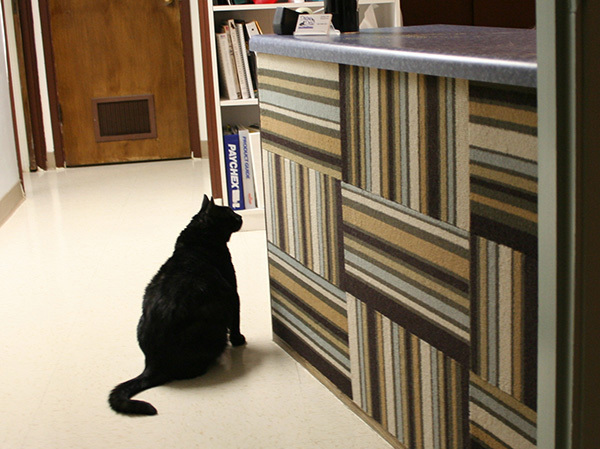 And finally, here’s a fun DIY wall scratcher I installed at my vet’s office. I just used carpet tiles and non-toxic glue to attach the tiles to the front of the desk area. All the office cats enjoy scratching and rubbing on this, and it still looks great years later. 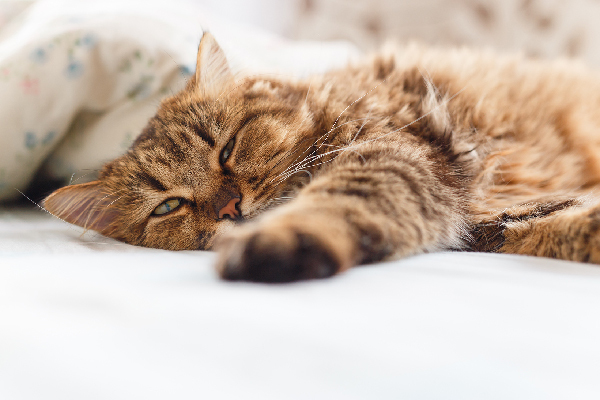 Do you have other space-saving tips for living with cats? Let us know in the comments! About the author: Kate Benjamin is the founder of the popular cat style blog Hauspanther.com. She specializes in helping people live stylishly with cats. You may have seen her on Jackson Galaxy’s show My Cat From Hell. 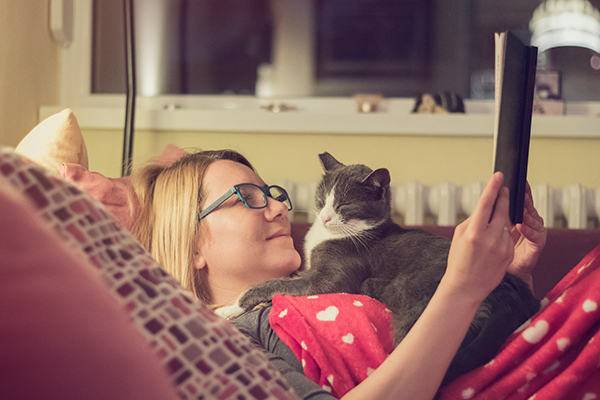 Make sure to check out Kate and Jackson’s new book, Catification: Designing a Happy and Stylish Home for Your Cat (and You! ).